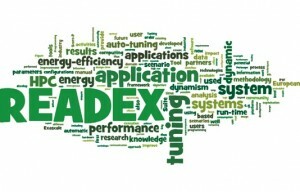 The goal of the READEX project is to improved energy-efficiency of applications in the field of High-Performance Computing. The project brings together European experts from different ends of the computing spectrum to develop a tools-aided methodology for dynamic auto-tuning, allowing users to automatically exploit the dynamic behaviour of their applications by adjusting the system to the actual resource requirements. The task of IT4I consists in the evaluation of dynamism in HPC applications, manual tuning especially of the FETI domain decomposition solvers, combining direct and iterative methods, and evaluation and validation of the developed tool, taking results of the manual tuning as the baseline. More information can be found at http://www.readex.eu.